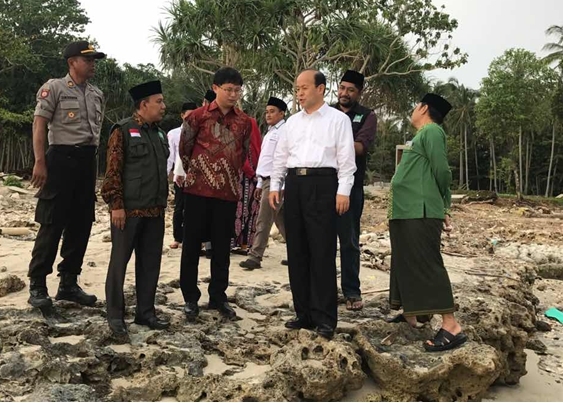 On 21st Feb., during his visit to Banten, Ambassador Xiao Qian went to Pandeglang to study the impact and recovery of the Sunda Tsunami, and visited disaster-stricken villagers in NU Peduli Field Post. Ambassador Xiao also brought to the villagers rice, oil, sugar and other daily necessities. Chairman of NU Care-LAZISNU (Lembaga Amil Zakat Infaq dan Shadaqah) Dr. Ahmad Sudrajat and Secretary of the Banten Province Nahdlatul Ulama Region (PWNU) KH Amas Tadjuddin accompanied the Ambassador during the visit. Ambassador Xiao said in his remarks that the Sunda tsunami last year caused severe casualties and property losses. Right after the tsunami struck, Chinese President Xi Jinping sent a letter to Indonesian President Joko to express deep condolences and sincere sympathies on behalf of the Chinese government and its people to the victims as well as the bereaved families and the injured. Red Cross Society of China also provided 100,000 humanitarian emergency cash assistance through Red Cross Indonesia (PMI). 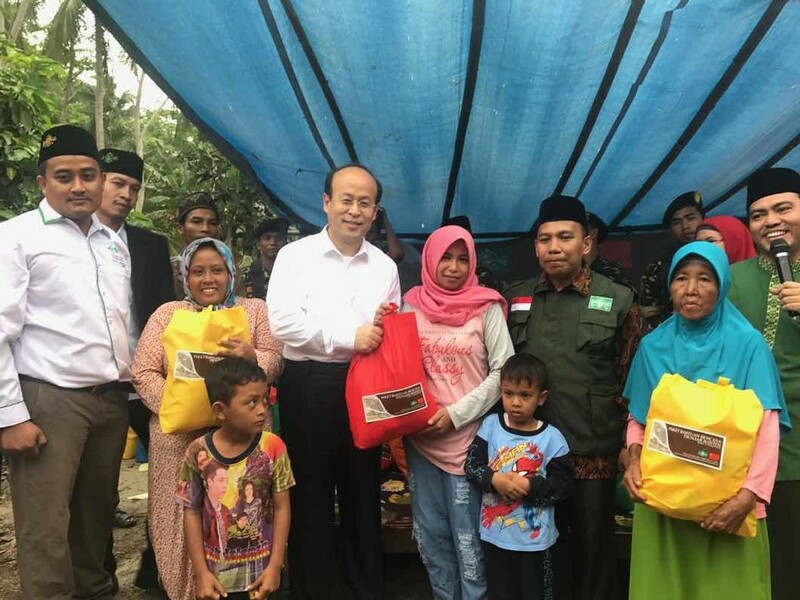 In addition, the Chinese Embassy also sent food, medicine and other disaster relief necessities to disaster-stricken areas through NU, Muhammadiyah and other major Islamic organizations in Indonesia. 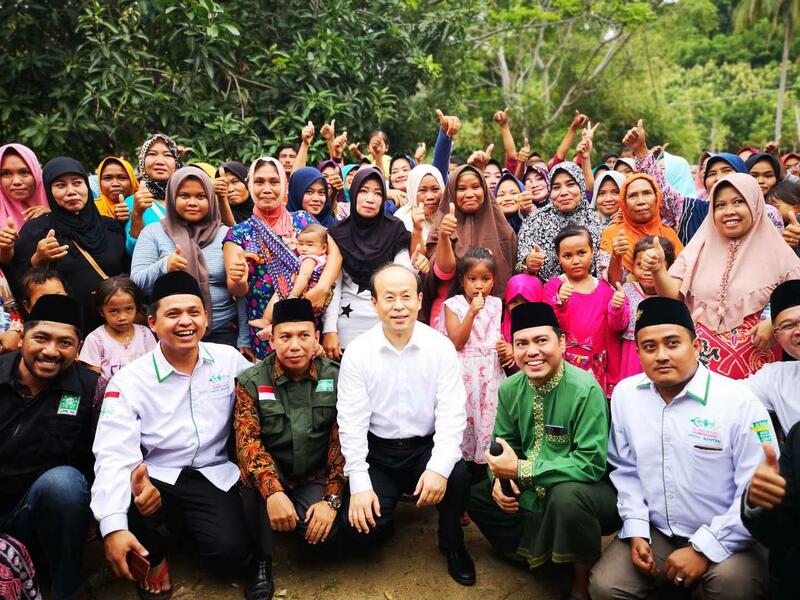 Chinese companies in Indonesia also took swift actions and donated in cash and in kind to the local communities. China and Indonesia are good neighbors, friends and partners who look out for each other. The Chinese side is willing to provide assistance in reconstruction at the best of our ability according to the needs of the Indonesian side. We believe that with the strong leadership of the Indonesian government and support from various communities in Indonesia, people who were stuck by the disaster will overcome difficulties, rebuild their homes and embrace an even better life. Dr. Sudrajat said, Indonesia and China have a long history of friendly exchanges, in which religion has been an important part. More than 600 years ago, Chinese voyager Zheng He visited Indonesia many times and promoted Islam in Indonesia, which is a wonderful story of our friendship. Whenever the Indonesian people came across difficulties, the Chinese government and people would lend help immediately, which fully demonstrated the profound friendship between Indonesian and Chinese peoples and Indonesian people is thankful for that. Though Indonesia and China have different religious and cultural background, the two peoples should strengthen communication and mutual-trust with the spirit of mutual understanding and respect, so as to carry forward the traditional friendship between the two countries. NU is ready to further strengthen cooperation with the Chinese side, and play a positive role for the Indonesia-China friendship. The villagers were happy and excited and applauded remarks by the Ambassador and Dr. Sudrajat. One of the villager said, thanks to the Chinese government and people for the care they extended to us, and we will remember this friendship forever.